Clearance Jewelry! Pearls, Gemstones, Necklaces, Earrings And Bracelets! 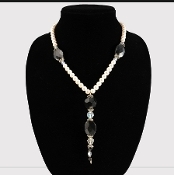 Enjoy Our Beautiful Selection Of Pearl And Gem Stone Jewelry. Most Items Are One Of A Kind! If You Find A Jewelry Item You Love, Be Sure To Order It Promptly, Or It May Be Gone Tomorrow. Customer Service 800-989-5166. Jewelry: Peach & Black Straw Pearl Necklace 20"